"It's the same every year, packed with muggles of course." Mrs. Weasley doesn't exaggerate when she makes that comment about King's Cross Station in Harry Potter and the Sorcerer's Stone (or Harry Potter and the Philosopher's Stone, as they call it here in the UK) by J.K. Rowling. It's packed, especially around the entrance to Platform 9 3/4, where muggles wait in a long line for a chance at running through the barrier. (Not really, as they have people working there, probably to prevent just that). If you're a Harry Potter fan, it's definitely worth a visit. 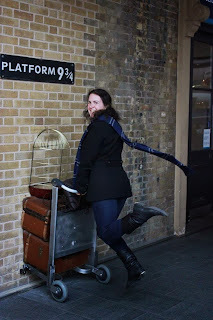 You'll be given a Hogwarts scarf of your choice, then you're able to pose for a photo with your cart, owl cage included! But if you want even more Harry Potter fun, definitely check out the WB Harry Potter Studio Tour. It is all sorts of magical. And yes, you're standing on the gigantic set of the Great Hall. Set of the Great Hall. 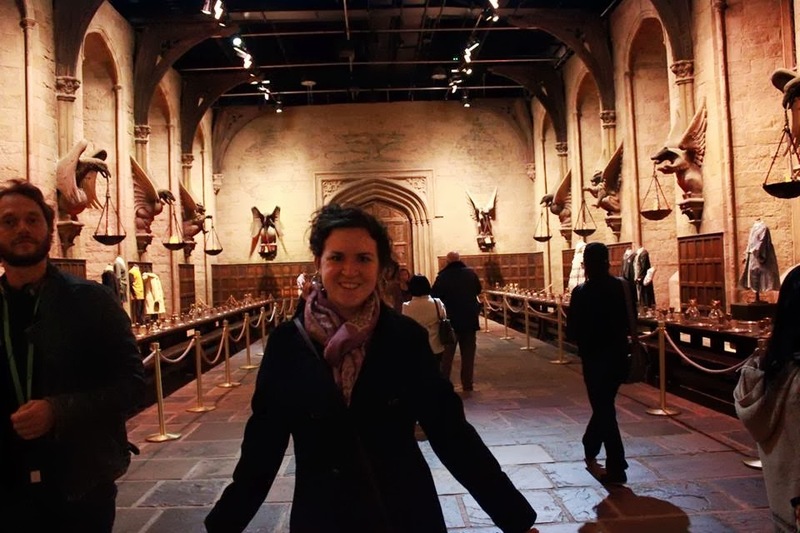 Me, on the set of the Great Hall. 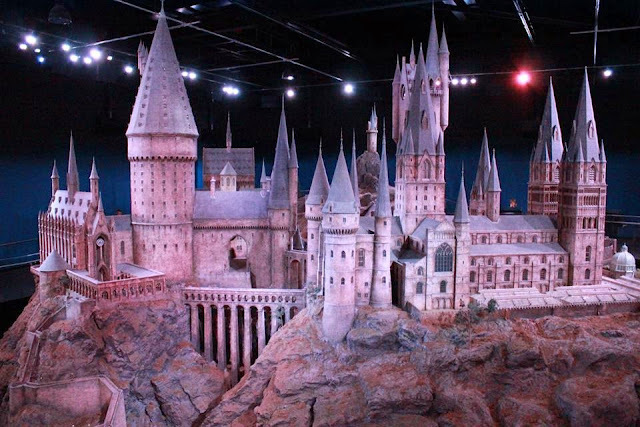 Afterwards, you move into a large studio, where you'll find the smaller sets: the Gryffindor Boys' Dormitory, Dumbledore's Office, the Potions Classroom, the Burrow's Kitchen, and the Ministry of Magic, among others. After the Great Hall, the Potions Classroom was probably my favorite set. It's much larger than this one photo shows. You'll also get to see some really cool props: the Malfoys' wigs, the door to the Chamber of Secrets, the Triwizard Cup, some broomsticks, and my personal favorite, the Mirror of Erised. There's so much that it takes a good two hours just to get through this part. Then it's off to a large courtyard, where you can take a break with a glass of butterbeer. This was my favorite part, not because of the butterbeer (though that is delicious), but because here is where you get to see (and even climb on, in a few cases) some of the best set pieces: the Weasley's flying Ford Anglia, the Knight Bus, 4 Privet Drive, Hagrid's motorbike, the Hogwarts bridge, the Potters' cottage, Tom Riddle's gravestone, and the giant chess pieces. 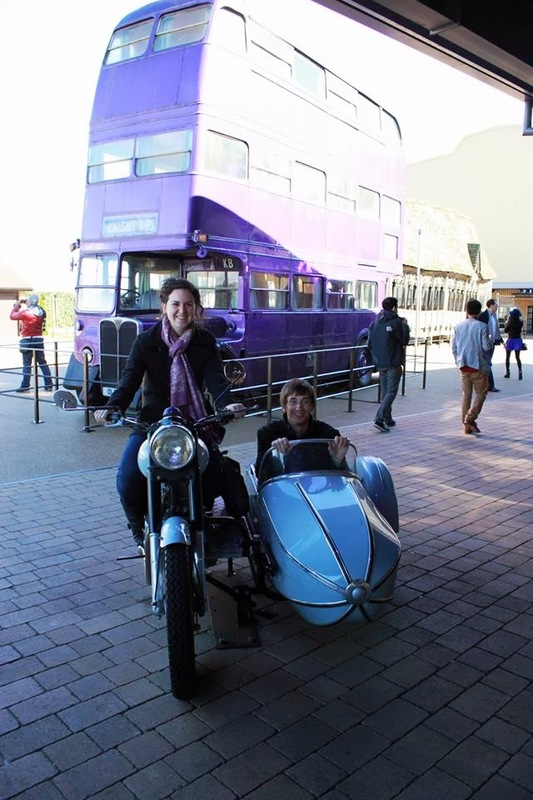 Josh and I ride Hagrid's motorbike, with the Knight Bus (and the Hogwarts bridge) behind us. 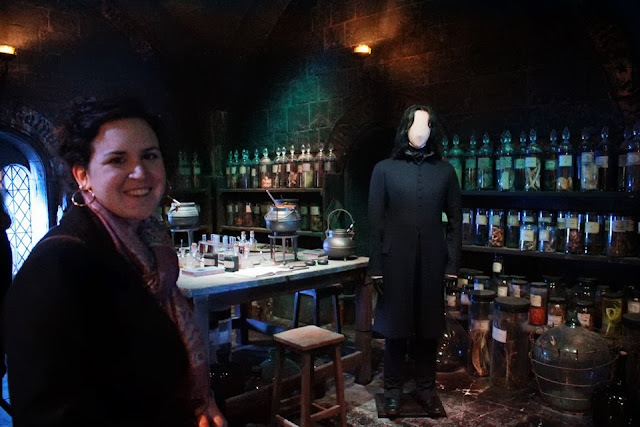 After that, you move into the creature room, where you'll encounter a wall of goblin masks, Fawkes the phoenix, Dobby, Buckbeak, and Aragog, among others. Afterwards, you'll get to take a stroll along the set of Diagon Alley. Finally, you end with the huge Hogwarts model, which they used for aerial shots of the castle. The set of Diagon Alley, complete with Ollivander's, Flourish & Blotts, and Weasley's Wizard Wheezes, among many others. This Hogwarts model is HUGE. If you're a big Harry Potter fan like me, you'll probably get teary-eyed. We did a pretty thorough exploration of London, seeing all the major tourist sites and more, but the WB Harry Potter Studio Tour was by far my favorite! If you're in the area, definitely check it out!